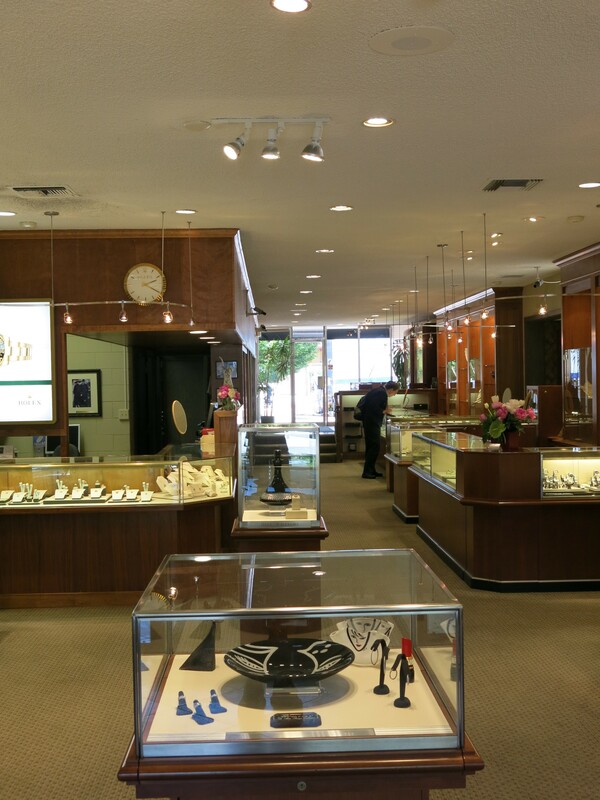 The requirements of high quality lighting drive jewelry stores to use the best lights available while the desire to reduce electricity usage drives them toward energy efficient lights. 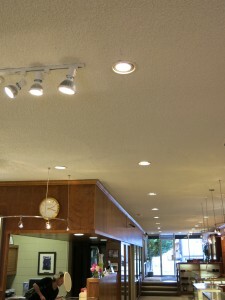 LED lights that deliver high marks in both of these areas are being installed in the Dell Williams store on Pacific Avenue. 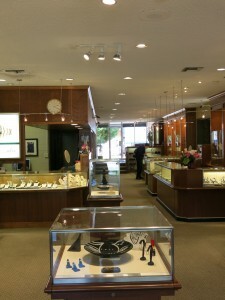 The dominant lights in jewelry stores today are halogen lamps in a variety of sizes but typically the MR16 (metallized reflector), a 2 inch diameter light and the PAR 38 (parabolic reflector), a 41/2 inch diameter light are used.This family of lights has the properties that bring out the best qualities in a wide array of jewelry products. The broad color spectrum emitted and high color rendering index (CRI) bring out the best colors in the precious metals and gems. The reflector and strong center beam intensity, the properties that make the lights twinkle and give these lights the punch to get from the light to the display, make the metals and gems sparkle and gleam without creating undesirable glare. High quality light also brings out the richness of the wood and metal in the store. 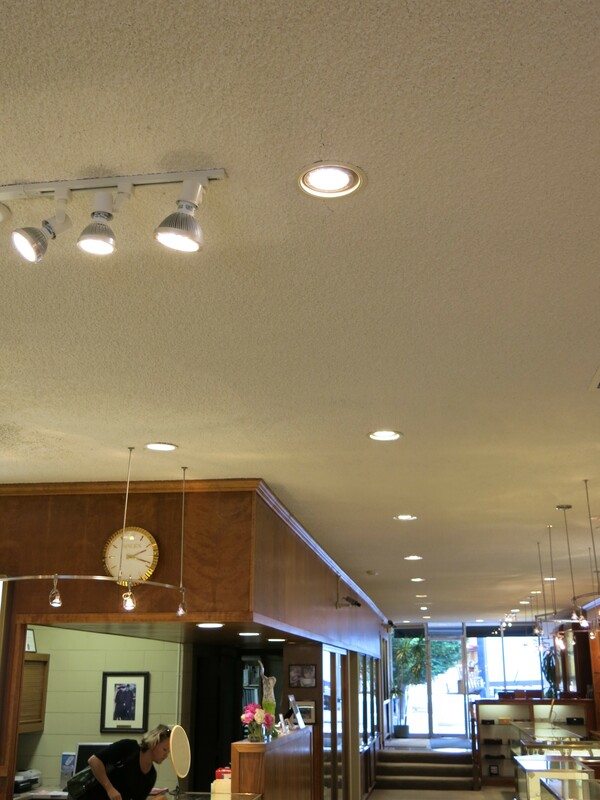 Dell Williams has installed LED PAR38 track lighting over the display in the front entry of the store and down the center of the store as recessed, ambient lights. 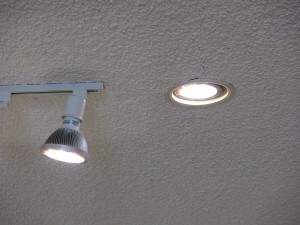 Several LED PAR38 lamps are now rated for recessed cans. At a conservative comparison of 100Watts required by a halogen PAR38 and 25Watts required by an LED PAR38 each installed light reduces the electricity required by 75% while providing high quality lighting. The electrician is Matt Steinmetz, matt@santacruzelectric.com.